So how is the rest of the world reacting to the memoirs of former President George W. Bush? Two of the articles we’ve posted on the subject in the past 24 hours express a mixture of resignation, anger and temperance about their veracity and significance. This information might or might not be accurate, but just the fact that a U.S. president mentions something, even if he’s a former president infamous for lying to his people and the world, lends it special significance and transforms it into a historical document! 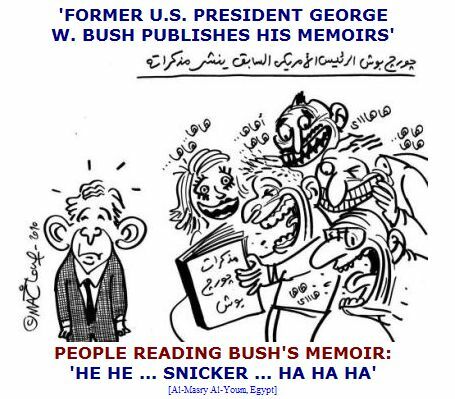 Many in the Arab and Islamic worlds may be reluctant to read Bush’s memoirs out of personal hatred for the man and his policies, or because they question the validity, value and motives of what he says. One is well advised to deal cautiously with all personal accounts, because they are more often aimed at defending their authors and justifying their decisions then revealing the truth. I recommend, however, especially to government officials, that they read these memoirs carefully. This will help them not only benefit from the lessons of the past, but anticipate the tragedies of the future. The second article, an editorial from Colombia’s El Espectador headlined Crimes Again Unpunished for ‘Reasons of State’, expresses outrage that the ‘offenses’ laid out in Bush’s book will go unpunished, just like so many other acts of the world’s great powers. In recent weeks, several pieces of information from the United States have come to light, all of which have in common the fact that due to what is called “reasons of state,” investigations into flagrant violations of human rights are to be filed away or entirely blocked. The latest instance is the publication of George W. Bush’s memoir Decision Points. The book justifies his decision to torture prisoners during the war against terrorism with a dangerous argument that it “helped save lives.” One clear-eyed journalist asked Bush if he agreed that this practice would be dangerous if applied to U.S. citizens by another country. A disconcerted Bush eluded a response. The fact that a former president of the most powerful country in the world continues to insist on justifying such reprehensible acts is an affront to civility and violates every norm of international coexistence. Closely linked to the above is the publication of official and classified documents about the war in Iraq by WikiLeaks, which revealed how officials of various ranks from the country to our north ignored or condoned acts of such as harmful and pernicious as the murder of civilians by their own forces. Rather than offering reasonable explanations for the allegations, U.S. authorities have preferred to criticize the leak of documents and the fact that this endangers the lives of U.S. troops. In other words, all indications are that nothing is going to happen regarding these revelations.